I love having people over for dinner. When I was in business school, I would have my American friends over for Bollywood movie night and Indian dinners after every big assignment or exam! The joy of dressing up the house, planning the dinner, bringing out the pretty dishes, silverware and colorful tableware, cooking the special dishes for Friday or Saturday night, that we could have as leftovers all weekend! Priceless. And of course, the delight of entertaining and discussing the intellectual bent of Indian movies. Ever present! My dining table stands dressed up with red tulips - for my dinner guests! In the foreground is an exotic tribal dancer statue, which has got nothing to do with Cardamom!! Now it's no different, whenever I have people over, whether it is for brunch, high-tea or dinner, I end up cooking Indian food. No brainer, you would think, considering my heritage and zeal for Indian cuisine, but its more than an unwavering passion for a confluence of spices from the sub-continent of my origin..It's a strong desire to communicate to my world, the magic of Indian spices, to share with my friends, the culinary and curative traits that these usual suspects possess. Cumin, Coriander, Fennel, Cardamom, Cinnamon, Ginger, Turmeric, Saffron..the list goes on! A smorgasbord of flavors, textures and wanton aromas that form the foundation of Indian cooking. Since time immemorial, humans have used spices to better their food, and their bodies. Our grandmothers knew which spices would settle an upset stomach, relieve inflammation and even something that got rid of intestinal worms! Now a spate of studies has finally proved that whether you've got achy muscles, a cold that just won't quit, or a case of the blues, reaching for a natural healer, may just be what the doctor ordered! This week's feature is about Cardamom. Native to India, Nepal and Bhutan, these three-sided spice pods with a thin, tough papery outer cover and tiny deep-brown to black seeds arranged in vertical rows have been a staple for sweet and savory dishes popular in Indian cuisine. Also known as "elaichi" or "ellaki", this dynamite pod, reigns supreme in all spice-aware households. Whether it is to lace a cup of steaming hot Masala Chai, or to add the flavored grounding to a kheer or pudding, Cardamom does not fail to deliver. Masala Chai (Tea Latte) prepared by boiling cardamom, ginger and tea leaves with milk. Perfect to soothe anything from an upset stomach to everyday frazzled nerves! The welcome drink for my dinner guests. This exotic spice contains many plants derived chemical compounds that are known to possess anti-oxidant, disease preventing and health promoting properties. The spicy pods contain many essential volatile oils. The therapeutic properties of cardamom-oil have found application in many traditional medicines as antiseptic, antispasmodic, carminative, digestive, diuretic, expectorant, stimulant and tonic. My guests are then serenaded with pista kesar (pistachio and saffron) lassi (yogurt based drink) laced with cardamom. Alongside is a zesty mixture of trail mix! 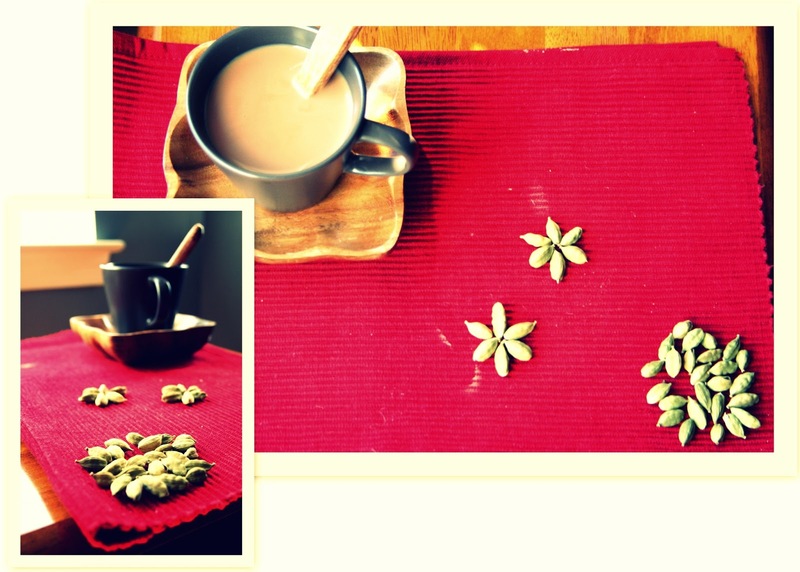 Cardamom is a good source of minerals like potassium, calcium, and magnesium. 100 g pods contain 1119 mg of this electrolyte. Potassium is an important component of cell and body fluids that helps control heart rate and blood pressure. Copper is required in the production of red blood cells. Additionally, this spice is also an excellent source of iron and manganese. 100 g pods contain 13.97 mg or 175% of daily-required levels of iron. Iron is required for red blood cell formation and cellular metabolism. Manganese is a co-factor for the enzyme, superoxide dismutase, which is a very powerful free radical scavenger. Further, these aromatic pods are rich in many vital vitamins, including riboflavin, niacin and Vitamin-C, essential for optimum health. 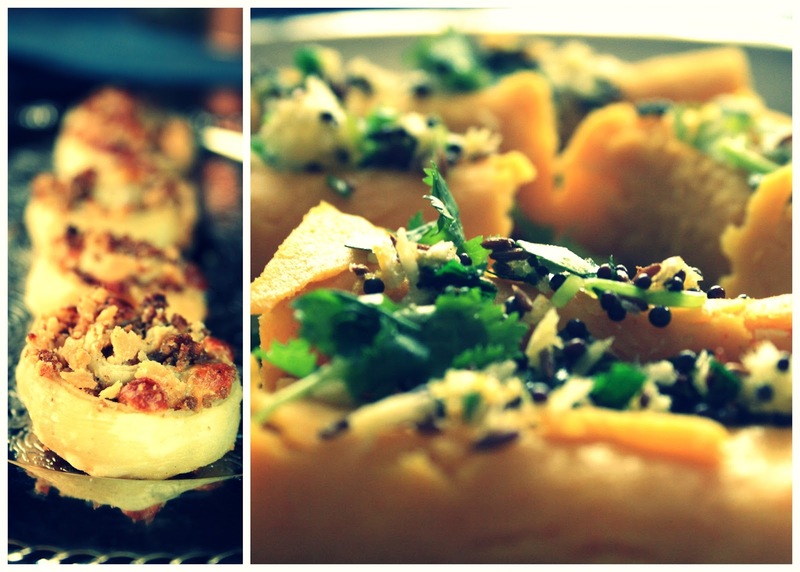 Cheesy Bakarwade Bites and Besani Khandvi accompany the chai. I decided to keep the dinner menu simple, serving traditional appetizers as main courses, in a move to cut prep time and calories! My guests are loving it! Now if that is not a good enough case for cardamom, I wonder what is! :) Stay tuned for more spicy adventures from my kitchen...straight to your palate! I am now going back to my party, my friends are calling me because they want me to demystify the lyrics of the popular Bollywood song (Fevicol se) pertaining to a strong adhesive brand! Kudos to Sripriya Murthy Photography and The Grey Area. Thank you! And you bet! Coriander, Cinnamon, Clove, Ginger and Turmeric lined up in my spice box and shutter, presented to you via Aalayam! Please come back for more. Thank you!! And I visited you blog too! Your feedback means a lot coming from a fellow blogger like yourself!! Keep coming back for more :). Thank you Shalini! This blog is a way we can create and share that atmosphere with all our virtual friends too!! :) Please keep coming back for more. Your feedback means the world to us!